The petition period for the 2019 race is closed. In rare instances, the Mount Marathon Race committee approves petitions because of special circumstances, such as documented outstanding results in other mountain races or other extraordinary circumstances. Petitioning is intended to offer a one-time (one race) opportunity to experience the Mount Marathon Race. Please note: An approved petition is only valid for the current year and resets the petitioner’s weighted lottery status back to zero for the following race year. If your intent is to gain entry to the race for more than one year, the lottery is your best path to entry. Apply as a lottery applicant for the Mount Marathon Race and pay the application fee. Complete an online petition during the race registration period (March 1–31). Establish your credibility as an experienced mountain runner or your mountain skills. Include results of other mountain races. Explain why you want to run the Mt. Marathon Race. Explain why you are not trying to gain entry via the auction. The auction occurs on July 3rd and the highest bidder wins. There is no auction for junior racers. 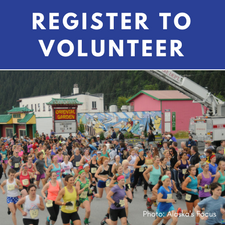 Explain how you will practice the entire race course prior to the race (if you live outside of Southcentral Alaska). Missing your volunteer opportunity will disqualify you from future races. Those who petition for a race entry will first be considered as a lottery applicant. If the petitioner is not selected through the lottery process, the petition will be considered by the race committee. Unless a petitioner wins the Mount Marathon Race, they may not gain priority status through an approved one-year petition, and must return to the lottery pool for the following year’s race.